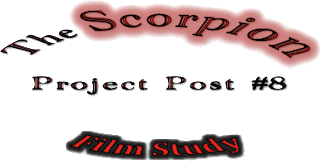 This is my eighth Scorpion Project post and my sixth and final literary theory post. Though there is no film adaptation of The House of the Scorpion, there is a film called Gattaca which bears similarities to The House of the Scorpion in some ways. For this post, I will be specifically comparing and contrasting the two protagonists. The main character of The House of the Scorpion is Matt, who is a clone of the powerful drug Lord, Matteo Alacran (more commonly known as El Patron). The main character of the film Gattaca is Vincent, a natural-born (or invalid) who, with permission, assumes the identity of the "valid" Jerome. There are many connections to make between the two protagonists. First of all, they are both different and an outcast in society. Vincent does not get the opportunities he would if he were conceived differently, and Matt doesn't either because he is restrained by the fact that others do not want to associate with him. Not only this, but both are automatically blamed for someone else's crime just because they are different. For example, Vincent being blamed for the mission director's death, and Matt for Furball's. I also noticed that, growing up, both are treated dramatically if something as small as a scratch occurs (Vincent because he has a shorter life span and Matt because of his organs for El Patron). In a way, Vincent is like a clone of Jerome Morrow. This is because he has to act like him, look like him, be him all the time. Matt, being a clone of El Patron, sometimes acts like El Patron and looks like him. Both are still their own selves inside though, even if everyone and everything points to the conclusion that they are the same. Both struggle to find themselves and express themselves when their constantly pegged as someone they're not. Spoiler! At the end of the movie, Jerome commits suicide. At the end of the novel, El Patron dies. This allows both protagonists to assume the identity of the person they have been imitating for a large portion of their lives. However, the protagonists can also be contrasted in the opposite way: by their differences. Vincent allows Jerome to kill himself without protesting or further discussion, while Matt is devastated at Tam Lin's choice to take his life. Another difference is the fact that Vincent is an adult, while Matt starts as just a child and grows into a teenager. I am guessing the difference in their reactions to their friends suicidal actions differ so greatly is a combination of two factors: age/maturity and their personalities. Spoilers over! Thanks for reading! This is my last literary theory post on The Scorpion Project novel study I participated in. The book is very interesting and thought-provoking, and I encourage everyone to read it.